The finale of "The Big Bang Theory" was awesome. Stomach hurting funny. Raj (Kunal Nayyar) and Wolowitz (Simon Helberg) use a computer dating service to find a 'perfect' mate for Sheldon. After Wolowitz fails to convince Sheldon to go on the blind date, Raj convinces him by threatening that he hid a dirty soiled sock somewhere in Sheldon's apartment (Sheldon dirty sock phobia). 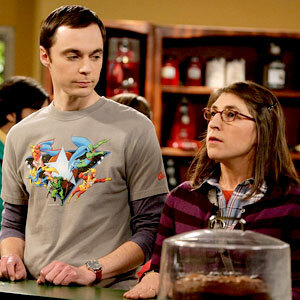 Needless to say, Sheldon meets Amy, "Blossom's" Mayim Bialik, and she IS perfect for him. Amy is really a female Sheldon. Their banter is perfect and she clearly gets Sheldon's attention right away. The dynamic between them is so explosive that it reminds me of when Mork of "Mork and Mindy" first showed up on "Happy Days" and completely upstaged The Fonz. She does not so much upstage Sheldon though as complement him. This could be very good. I cannot WAIT for next season. My second favorite show right now ["Entourage" is first] just got better.